Do you know that a flea can break the current world record for long jump in the Olympics by about 970 feet if it were the size of a human athlete? Aside from being great jumpers, they are atrocious in their capacity to cause serious diseases, which is why the best flea shampoo for dogs is a must. Fleas should not be taken lightly. Hard ticks' saliva have anesthetic and anti-inflammatory compounds that make the host unaware that they have been bitten. It also contains proteins that change compositions making the host's immune system oblivious to infections and diseases until it's too late. Some bites result to "tick paralysis" which, if left untreated, can be fatal. On top of this, fleas and ticks harm humans as well. Lyme disease, for instance, has caused severe and chronic symptoms to patients that affect the heart, nerves, joints, eyes, and brain. In extreme cases, it can lead to disabling symptoms such as impairment of lower extremities. This, combined with the fact that a female flea can lay up to 2,000 eggs in its lifetime while consuming 15 times its body weight, makes fleas difficult to manage. Here are some ideas to get you started with the 'de-flea-ing' process. It may be worth your time to check additional measures to get rid of these parasites while using the best flea shampoo for dogs. Here are additional methods to consider. This medication is spread through the body via the oil glands. Contrary to popular belief, it does not wash off when the dog is exposed to water. This method can repel fleas and interrupt their life cycle for several weeks before reapplication. To ensure maximum benefit, choose the appropriate product for your dog's size, breed, and age. Effective but risky, this potent chemical can be toxic to both you and your pet if not used properly. As the chemical content is powerful, this option is best used for severe infestations only. Puppies below four months old and pregnant or nursing dogs are prohibited from using dips. To be safe, consult your veterinarian first before using it. Collars are effective depending on the degree of infestation. It needs to fit properly and make enough contact with your dog's skin for the chemicals to spread and work efficiently. Some dogs are also prone to allergic reaction so you need to carefully read the labels to ensure it's the appropriate collar for your dog's age and size. Perhaps the cheapest method in this list, flea sprays and powders are effective, but you may need to reapply it more often than an on-the-spot medication. This method also comes with side effects like irritation of the lungs and mouth to both you and your pet. Be cautious in applying particularly around the nose, mouth, and eyes. Vacuum every corner of the house including the car. Even if you do not bring your dog inside the car, fleas may have been attached to your shoes or clothes. Consider using yard spray like this Black Flag Flea and Tick Killer. This is an awesome product because it effectively kills yard fleas and ticks and it lasts for up to 4 weeks. It also covers up to 5,000 sq. ft. of yard so this is absolutely useful if you have a big yard to clean. If the situation is out of hand, you may also want to consider hiring pest control service. This way you get professionals to deal with the chemicals for you. The top 5 products mentioned here are perhaps among the most favored in the market today. However, if you want to try out other shampoos that you have found on your local veterinarian shop, here are some commonly used ingredients to remember when looking at the label. These are synthetic compounds that are manufactured in laboratories. While they do not have the same instant effects that natural pyrethrins are known for, the effects of pyerthroids last longer. Both compounds attack the pest or insect's central nervous system while inhibiting their other bodily functions. ​Derived from chrysanthemum, this natural extract works by disrupting sodium's natural flow from the nerve cells. In effect, the pest's central nervous system fires off and eventually kills them. The best part about this is that since it can be broken down by stomach acids, ingestions rarely end up becoming toxic. This is always useful in getting rid of fleas. Lukewarm water with an effective flea shampoo usually does the trick. Here are some of the best flea shampoo for dogs in the market today. If you do not want to use harsh toxic chemicals on your pets, this 100% plant-derived shampoo may be a good choice for you. It is formulated with cedar oil, rosemary, and mint that helps keep your dog's coat fresh and free from fleas and ticks for up to 1 week. The natural ingredients also solve issues on allergic reactions to stronger chemicals so that it's good for the skin. In effect, you'll notice how your dog's fur is so much softer and cleaner. At the same time, you won't feel itchy after each bathe. It helps that it smells so good too. There are dogs that have sensitive dermal conditions and this requires the right formulation to cleanse and provide extra gentle care as well. This vet recommended product from Pro Pet Works is especially formulated for allergic reactions to flea bites, food, and grass. It is PH balanced for sensitive skin while smelling sweet with cherry and almonds. If you are considering natural and organic ingredients to help provide soothing and therapeutic relief for your pets, this may be included on your list. Aloe-enriched, organic, soap-less, and detergent-free, the special formulation contains vitamins A, D, and E that won't irritate your dog's skin, eyes, and nose. The formulation works best for easy to brush coat that smells clean and stays that way for a couple of days. It is non-alcoholic and non-toxic on top of being cruelty and paraben free. Since it is gentle, it is best to use for regular bathes to get rid of fleas and ticks. 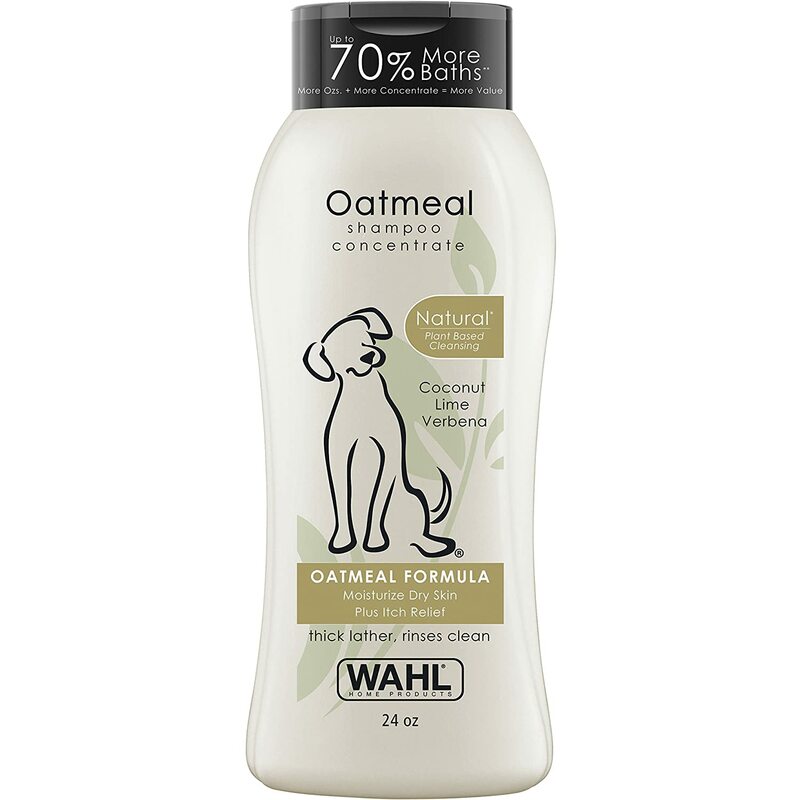 Despite being generally effective in relieving itches and other allergic reactions, there are some dogs that do not respond well to this shampoo. In which case, it is best to have your pet checked by the veterinarian since the reaction may have a more serious underlying cause. There may also be instances where the fresh scent disappears quicker on certain dogs. Keep in mind that this also depends on your dog's activities as well as natural body odor, which differs from one dog to another. One of the most disturbing effects of flea bites is the constant scratching and agony that come with it. This product from Bella's Best has pure neem oil, which is a really good natural ingredient that provides relief from the constant scratching and itching. This ingredient is also a natural insect repellant so it works well in getting rid of fleas and ticks. It also comes with oatmeal, which works really well for inflamed skin. Ingredients are all 100% natural and safe. It is non-toxic and has absolutely no alcohol, soap, or detergent. Aside from relief from scratching, the natural formulation also makes your dog's coat well conditioned and nourished. This means you don't need to get a conditioner. At the same time, you expose your dog to fewer products, which also lessens the risk of allergic reactions. Some dogs may have other underlying conditions that manifest through skin irritations. In this case, using this product may provide a little relief, but not entirely cure the problem. 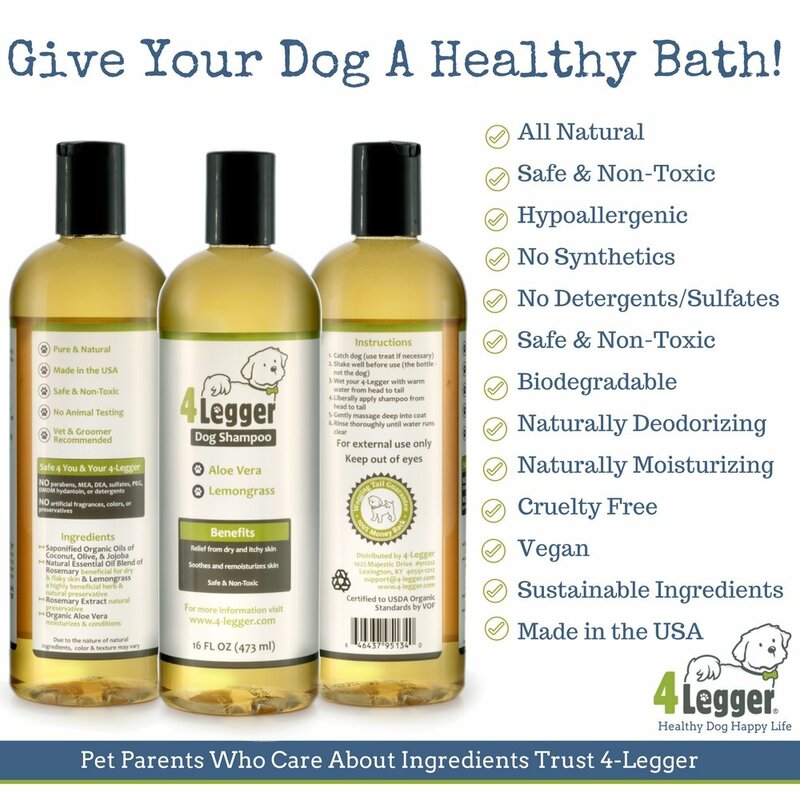 This all natural and hypoallergenic product by 4-Legger is made from aloe vera and lemongrass. 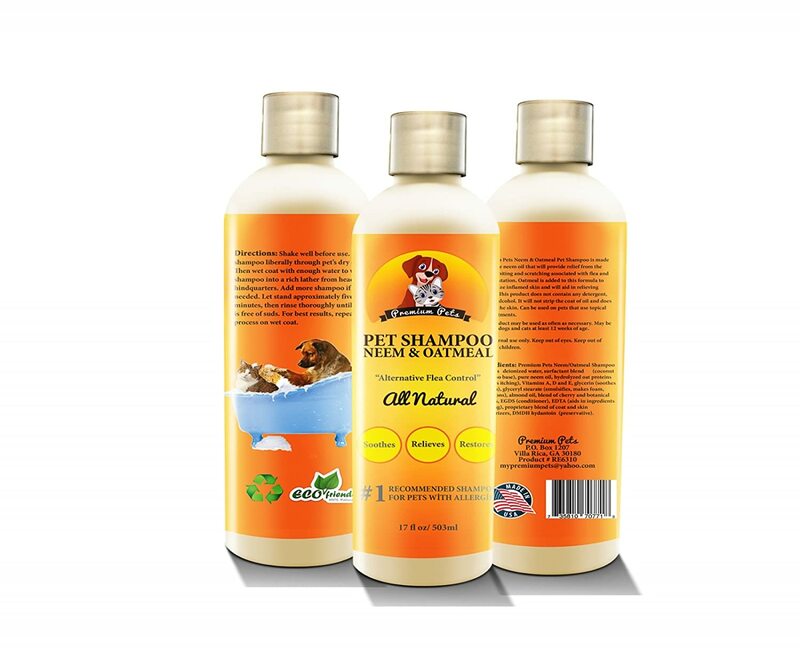 It is USDA certified organic pet wash, which is detergent-free, sulfate-free, paraben-free, and non-toxic. It is also certified to have no artificial or synthetic content.It is wonderfully scented - not too strong to make you sneeze even. It lathers quite nicely as well so you can give your dog a nice long bath to soothe itchiness and get rid of fleas and dirt as well. It is quite watery, which makes it difficult to manage especially if your dog tends to move a lot during bath time. This helps clean and soothe your dog from itchiness, which may eventually lead to fewer fleas. However, if the infestation continues despite constant cleaning, you may need to check with your veterinarian for the right treatment to get rid of the fleas. This is important since your dog may be already sensitive to new treatments. This formula is especially designed to repel fleas while taking care of your dog's sensitive skin. 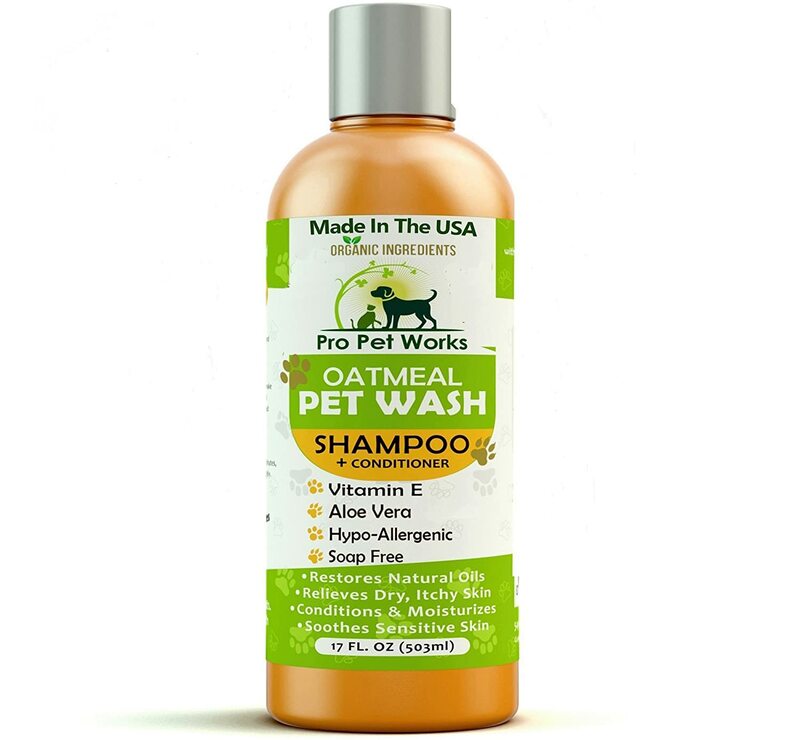 This tear-free shampoo is easy to rinse and made from natural ingredients that it's really not a problem if your dog licks his or her coat even if you missed rinsing some of the product. The main issue here really is how effective this product is in terms of repelling fleas and other insects. This wash offers that benefit, although its effectiveness may vary depending on the severity of the flea infestation. Check the severity of your dog's flea problem. Although this has the potential and the ingredients to keep fleas away, you may want to observe how effective it is in getting rid of fleas, ticks, and other insects. 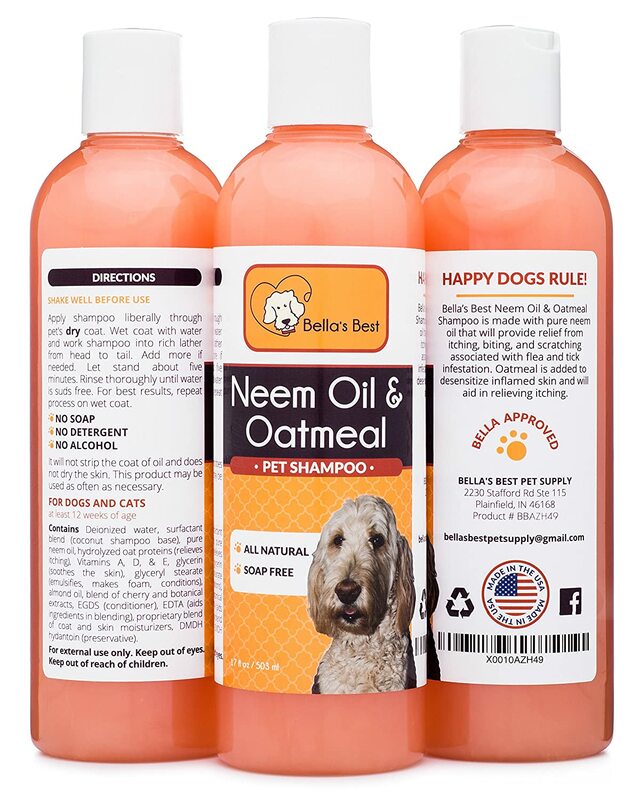 Of all the products mentioned, Bella's Best All Natural Pure Neem Oil and Oatmeal Dog Cat Shampoo wins by a slim margin. All products mentioned in this review have received positive response from pet owners and are recommended by veterinarians as well. Flea shampoos work best in conjunction with other flea control methods. The faster you act on managing flea population, the less damage it creates to your household and, of course, to your dogs. Most importantly, if you want to get a long-term solution and t﻿h﻿e best possible outcome, you may need to try out different products and experiment on various methods of flea control. Each case varies depending on dog breed, age, and environment among other factors. This should help guide your choices on which products fit within your circumstances.